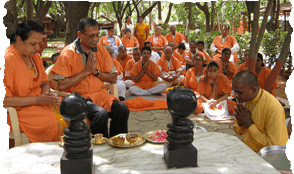 The Dharma Sevak Course is a short-term Vedanta Course aimed at giving knowledge of Vedanta and training to sincere seekers and devotees and set them firmly on the spiritual path. The course gives clarity in the understanding of intensive spiritual practices. It is only when the inner personality of an individual is properly trained that hidden abilities and energies get channelised in a constructive way. Such a person leads his or her own life with a balanced mind, intellectual poise and courage; such a person is able to contribute positively for the benefit of society. 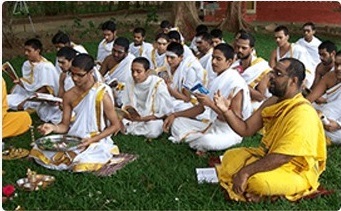 The Chinmaya Dharma Sevak Course covers different texts and as in any Chinmaya Mission scriptural course, students live the disciplined life of being in a modern gurukula. Eligible candidates should be below 65 years and in sound health. They should have a strong desire to study the scriptures and live a spiritual life, with sufficient grasp of English. Knowledge of Sanskrit is not a must. • The overall meaning is, “that which upholds, nourishes, sustains, and integrates.” The most popular example of dharma is ‘the essence or substratum of a thing,’ as in, sweetness is the dharma or substratum of sugar, for without sweetness it would not be called sugar. 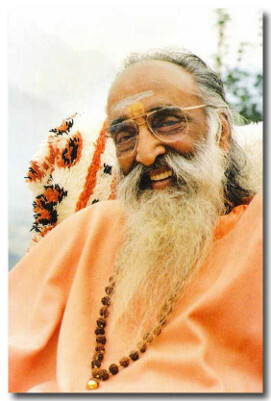 A sevak is one who does ‘seva’. Seva refers to selfless service. The Dharma Sevak Course is thus for the spiritual aspirant who ardently seeks the Lord within, courageously lives noble values, and humbly serves humanity as a worship of the Supreme. Jnana Yoga: the study of the Upanishads, Shrimad Bhagavad-gita and introductory Vedantic texts. Bhakti Yoga: the study of devotional texts such as Ramayana or Shrimad Bhagavatam. 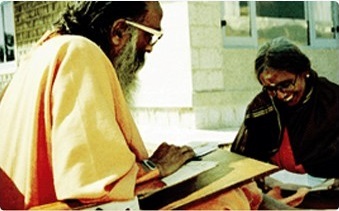 Karma Yoga: service in the ashram and growth in one’s vision of dedicated service to the world. A brief but very significant part of the six-week Dharma Sevak Course is the opportunity to listen to discourses of Swami Tejomayananda, Head of Chinmaya Mission Worldwide. The scriptures point out that the company of Saints is unfailing. The daily schedule starts with morning meditation, followed by lectures, breakfast, Vedic chanting, Sanskrit classes and discussion groups. The evening includes personal walk time, arti, and inspiring satsangs with different acharyas speaking about their spiritual journeys. During the entire period, there are no holidays and the students are not allowed to leave the campus. Accommodation consists of comfortable twin-sharing rooms with attached bathrooms. Wholesome, saattvika, vegetarian food is served.